The Give2Asia SketchCrawl website is ready! Please direct your donations and/or sponsors to this dedicated webpage! For those of you outside the US, you can still make donations to Give2Asia but they won’t be tax deductible, we recommend choosing a local non-profit of your choice that is working in the Japan disaster relief. 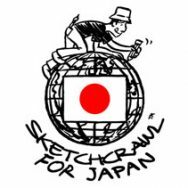 And be sure to come to the SketchCrawl forums too see where Crawlers are getting together!